· Takeover Regulations -7(1), 7(1A), 7(3) persons acting in concert, etc. 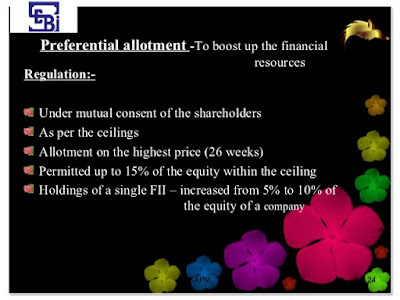 · SEBI DIP Guidelines – Preferential Issue Guidelines. 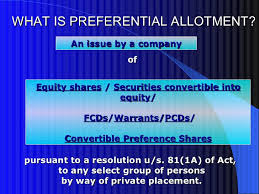 Ø 10% of the PRICE shall be payable at the time of allotment of warrants. 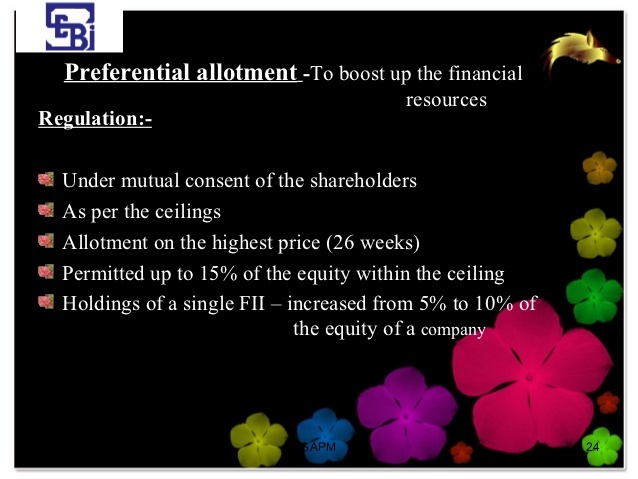 This amt will be forfeited if the option to acquire shares is not exercised. Ø Option to convert Warrants and other financial Instruments should be exercised within 18 months of date of issue of security. Ø Instruments allotted on preferential basis to promoter / promoter group shall be subject to lock in of 3Yrs. However only 20% of the total capital of the company including capital brought in by way of preferential issue shall be locked in for 3 Yrs and remaining shall be locked into a period of 1 year. Ø Instrument should be allotted within 15 days of EGM Resolution .in case not allotted within 15 days then fresh EGM should be called and resolution should be passed. 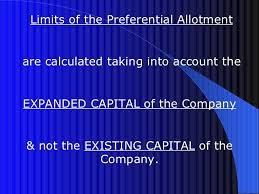 Ø Entire pre preferential holding if any of the allottee shall be locked in for a period of 6 months. Ø Securities allotted on preferential basis to persons other than promoter shall be locked in for a period of one year from the date of issue of security. · Dispatch notices and agenda to all the directors in writing. · Hold the Board meeting and the get the Bonus Issue and increase in authorised capital if required approved by the Board. · Within Fifteen minutes of the board meeting fax the proceedings of Board Meeting to stock exchange about outcome of the board meeting as regards to decision of the board to issue shares on preferential basis, notice of EGM and increase in authorised share capital. Also information under clause 36(7)(i) and clause 22(a) should be faxed within 15 minutes . · Letter under clause 24(a) of the listing agreement to Regional Stock Exchange ie BSE –“DCS/ Listing department” asking for formalities which company needs to comply with in order to obtain In-principle Letter (next day / 2-3 days of Board meeting. · Six copies of notice of EGM should be send across to the stock exchange and 1 copy to NSDL, CDSL and R& T Agents. · Obtain mailing list from R&T Agents and dispatch notices to all the shareholders at least 21 days in advance as well also send the same to the auditors , PCS, and directors. · Obtain Lock In confirmation from NSDL & CDSL as regards to lock in of entire Pre Preferential holding of the proposed allottees as the same has to be submitted to the stock exchange for obtaining prior In Principle approval letter. · In while BSE will send a letter stating the formalities/ documents to be submitted which company needs to comply with for obtaining Prior In Principle approval. However In principle approval will be obtained by the company only after EGM is held as we have to submit EGM resolution for obtaining In principle approval. · Advertise the notice of EGM in the newspapers at least 7 days before the EGM. · Obtain In principle approval letter from BSE. AS ALL THE FORMALITIES IN RELATION TO ALLOTMENT OF SHARES/WARRANTS HAS TO BE COMPLETED WITHIN 15 DAYS from the date of EGM, intimate stock exchange of the Board Meeting to consider allotment of warrants / shares. · Next day inward letter to the Stock Exchange DCS department informing regarding the allotment of warrants / Shares along with Board Resolution. · Also as per in-principle Listing Letter intimate NSDL and CDSL about the Lock In of the Shares allotted. · Forward the confirmation letter from CDSL and NSDL to the Stock Exchange regional, BSE and the certified copy of the Acknowledgement of NSDL and CDSL for Lock In of shares should be also submitted to the stock exchange.